Rules of Golf: Drop Within One or Two Club-lengths? “When you take free relief under the Rules, e.g. from an immovable obstruction, casual water, GUR, wrong putting green, or a staked tee (when there is a Local Rule), you must drop within one club-length of the nearest point of relief, not nearer the hole. Whereas, when you are taking a penalty drop, e.g. from a lie you deem unplayable, or a lateral water hazard, then you are permitted to drop anywhere within two club-lengths of where the ball was at rest, for an unplayable lie, or from where the ball last crossed the margin of a lateral water hazard, not nearer the hole." Rule 20-3b: Except in a hazard, if the original lie of a ball to be placed or replaced has been altered the ball must be placed in the nearest lie most similar to the original lie that is not more than one club-length from the original lie, not nearer the hole and not in a hazard. Rule 24-2b: Nearest point of relief from immovable obstructions. Appendix l, Part B, 2b, lll (a): Nearest point of relief from environmentally-sensitive areas. Note: In each of the three above situations the player must lift the ball and drop it, without penalty, within one club-length of and not nearer the hole than the nearest point of relief. Rule 25-3b: If a player’s ball lies on a wrong putting green, he must take relief, without penalty by lifting the ball and dropping it within one club-length of and not nearer the hole than the nearest point of relief. Definition of teeing ground: The teeing ground is a rectangular area two club-lengths in depth. Rule 20-2c(vi): A drop is invalid and the ball must be dropped again if it rolls and comes to rest more than two club-lengths from where it first struck a part of the course. Rule 26-1c: In taking relief from a lateral water hazard, under penalty of one stroke, the player may drop a ball outside the water hazard within two club-lengths of and not nearer the hole than (i) the point where the original ball last crossed the margin of the water hazard or (ii) a point on the opposite margin of the water hazard equidistant from the hole. Rule 28c: One of the options for an unplayable ball, under penalty of one stroke, is to drop a ball within two club-lengths of the spot where the ball lay, but not nearer the hole. Appendix l, Part A, 5.d: A Local Rule may give relief without penalty from the intervention of immovable obstructions (e.g. sprinklers) on or within two club-lengths of putting green, when the ball lies within two club-lengths of the immovable obstruction. So, how long is a club-length? The answer is that it can be the length of the longest club that you are carrying in your bag, which typically is a driver. However, there is nothing in the Rules that says that you must use the club to accurately measure the distance. Providing it is obvious that you have dropped the ball within the required area, the drop is valid and the ball is in play if it comes to rest within two club-lengths of where it first hit the course, not nearer the hole than where it was originally at rest. If you do carry a long-handled putter in your bag there is nothing in the Rules that specifically prohibits using it to measure club-lengths, but I urge you not to do so, as it is very much against the spirit of the game. To my knowledge no professional on the major tours has ever used a long-handled putter for measuring in competition play. Please forward the link to this blog to anyone that you think may be interested. You can receive notice of my blog entries by email if you enter your email address in the box at the top right of this web page. Thanks, Barry. A great refresher course. Whenever the Rules permit a player to take relief from the nearest point of relief they should use the club with which they would have made their next stroke if the condition were not there to simulate the address position, direction of play and swing for such a stroke. Note that the word used in the Definition of 'nearest point of relief' in this respect is "should", not "must". However,like not using a long-handled putter for measuring club-lengths, it is something that all golfers should strictly adhere to. Hi Barry, good article once again. I often find players are under the misunderstanding that the club they intend to use to play their next shot is the club they should use to determine the one club length from the nearest point of relief. As we know this club should be used to determine the nearest point of relief, but may also be used to determine the one club length (no compulsion to use it though). A lot of players also think they need to use this club to actually play the shot once the ball is back in play after the drop when any club may actually be selected. Thanks, Your last point is important. Though you should use the club that you intend to play with when you determine the nearest point of relief, when you have dropped the ball it may come to rest in a position that requires a totally different shot. So you may then change the club for a more suitable one. Hi Barry, I'm interested in the picture that shows the clubs being used to measure a distance: they aren't horizontal. Most distance measurements in golf are horizontal. Is there a reference in the rules saying so? Generally, it should be to a player's advantage to measure horizontally. In measuring club-lengths when the ball lies on the ground it is not permitted to measure horizontally across different levels. Therefore, in the circumstances of the drawing you may either measure a) along the ground on the top level, down the wall and along the ground at the lower level, or b) directly over the top of the wall (as illustrated). If a ball lies off the ground (e.g in a tree) then you may measure the club-lengths from the point on the ground immediately below the place where the ball lay in the tree. Hi Barry. Re rule 20-2c(vi): If the drop is on a slope adjacent to the hazard where the ball simply will not stay within 2 club-lengths when dropped, does the rule provide that after 3 "invalid" drops, the ball then may be placed within 2 club-lengths of the point where the ball crossed the hazard line? Thanks. If the ball rolls more than two club-lengths from where it touches the course (or any of the other invalid places that it might roll to as listed in Rule 20-2c) then the player must re-drop the ball. If it again rolls to an invalid place it must be placed as near as possible to the spot where it first struck a part of the course when re-dropped. In other words the player must place the ball after two drops that do not satisfy the requirements of the Rule and not three. I am not sure what point you are making here but what you write cannot happen. When a player is taking 'nearest point of relief' they have to drop within one club-length (not two) and so the furthest that the ball can roll to is nearly three club-lengths from the nearest point of relief. Dropping within two club-lengths is one of the options (under penalty of one stroke) for a ball unplayable, or relief from a lateral water hazard. In both these cases it is indeed possible for a ball to roll three and a half club-lengths from where the ball was at rest (ball unplayable) or from the margin of the hazard (relief from lateral water hazard). HI Barry, I'm confused! 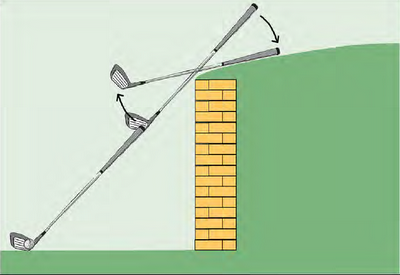 When dropping the ball, whether 1 club length or 2, are you saying that if the ball first hits the ground within the prescribed distance ( either 1 or 2 club lengths, depending upon the circumstances), the ball may roll outside this drop area so that it is further onto the course, for another distance equal to the original 1 or 2 club lengths allowed? I think some pictures or diagrams would be beneficial. Please can you tell me if an unplayable ball is dropped within the 2 clubs lengths and rolls outside of this distance, can the player then play his ball from that position or must it always be placed and then played within the original 2 club lengths? Yes, the ball can roll up to two club-lengths from where it first touches part of the course after being dropped, not nearer the hole and providing it does not roll into any of the other places listed in Rule 20-2c. Just to clarify this, does this in fact mean that the ball could possibly land up to a FURTHER 2 club lengths and therefore now be up to 4 club lengths away from the original part it first touched the course. Can the player then play inside this 4 club length position? Yes if the ball was dropped right at the limit of the permitted two club-lengths relief and it happened to roll two club-lengths further from that point, not nearer the hole, then obviously it would be almost four club-lengths from where it originally was at rest. The player must play the ball from here unless the drop contravened any of the exceptions in Rule 20-2c. This does seem a very generous ruling to a "2" club length drop, especially if the ball is deliberately dropped right at the limit and then rolls to an even more advantageous playing position. Wow, I also thought that the 2 club length drop meant exactly that, only 2 clubs and then the ball had to be placed after two attempts within that distance, not up to 4 club lengths! This rule opens itself to cheating albeit allowed, don't you think? There has to be some allowance for the ball rolling, otherwise players would be permitted to place their ball after the second drop on the majority of occasions. I am sure that you will agree that in most cases it is difficult to get the ball to move in the direction that you would like. Just as often it rolls into an unfavourable lie. Although the ball may come to rest up to four club-lengths from its original position this would be exceptional. Usually, the player will drop well within the two club-lengths permitted and the ball will only roll a few inches. the committe has designated rare heather surrounding tee boxes as environmentally sensitive areas warranting a free drop within one club length. Does rule 20-2c(vi) 'invalid drop' apply to a drop within one club length without penalty? Yes, all of the provisions of Rule 20-2c apply to a ball that is dropped under the Rules. The Local Rule seems very prohibitive, if it reads as you say. I would recommend that it should be changed to one club-length from the nearest point of relief, not nearer the hole, so as to ensure that there is room to drop without the environmentally sensitive area interfering with the player's stance or area of swing. The rule re: dropping to avoid the heather does state avoiding interference with intended stance or swing however, the committee have set a local rule stipulating that that the ball is to be dropped once even if it roles much further than two club lengths so long as it is not nearer the hole. I presume they have the authority to do this under the Local Rules conditions in Appendix 1? This sounds to me that it might breach Rule 33-8b, but I would need to see the actual wording of the Local Rule. You can email me direct at rules at barryrhodes dot com. It sounds as though you were playing with a very bad loser. If a player's ball is lying in casual water in a bunker, or if their stance is in casual water, then one of the options they have is to drop a ball out of the bunker on an extension of a line from the hole through where the ball lay in the water in the bunker for a penalty of one stroke, Rule 25-1b(ii)(b). I calculate that with the two penalties that he incurred (more if he did not drop in the correct place on both occasions) you won by at least one stroke. Barry, my nephew, who is playing on a high school team, said that when dropping, you can use any club, even a team mates club. I said you have to use a club in your own bag but I can't find the rule that defines this. Help? If he borrows a club and drops a ball and plays it, he incurs no penalty provided that the same outcome could have been achieved with one of the player’s own clubs selected for the round. If he could not have achieved the same outcome by measuring with one of his own clubs, he incurs the penalty under the applicable Rule for playing from a wrong place. Barry, thanks for the quick reply. I am looking at the USGA 2010-2011 Rules of Golf book and can't find the wording under 20-2. Where else can I look, I need hard proof for him. I referenced Decision 20/2, not Rule 20-2. Here is the link. Thanks Barry, that is very helpful. Apologies, the above link does not work. Just go to the blog archive at top right of my home page; select 2011, November; Two Golf Books for Christmas. The Rules of Golf do not prohibit a long-handled putter from being used to measure club-lengths and a referee should permit a player to use one. However, I and many others, discourage this practice, as a matter of poor etiquette, though I am aware that there are some that disagree with this view. It's a bit like cleaning a ball on the surface of the putting green or using the toe of your putter to mark a ball; there is no penalty, but they are bad practices, which should be discouraged. Can you take more than one relief if you had a lateral water hazard but a cart path interfere with your relief, can you take more than one relief? or MUST you take the shot from where you recently were? The correct procedure is to take relief from the lateral water hazard (e.g. within two club-lengths of where the ball last crossed the margin of the hazard) and then, if the ball comes to rest where there is interference from the cart path, take relief from that immovable obstruction (e.g. within one club-length of the nearest point of relief, not nearer the hole). A situation came about this week when a playing companion had a free drop from a cart path, he dropped the ball to the nearest point of relief but the ball bounced back onto the cart path and proceeded to roll away down the path away from the green, it could have run for fifty or so yards down the path, he stopped the ball and re dropped it from the original place of dropping it and went on to make a four. should he be penalized ? In most cases the player should wait until the ball comes to rest, in case it rolls back into the permitted area. However, in the circumstance that you describe, where it is clear that the ball will definitely come to rest outside the permitted two club-lengths from where it first hit the course after the drop, the player is entitled to stop it, so as not to unduly delay play. Hi. I was just fascinated by your comments above. Great stuff. Last week on the European Tour playing in Malaysia a player thought he took an incorrect two club relief in the second round. He didn't fully realise this until he finished all four rounds and won Euros5,000. He realised his error without being told by his playing partners, match officials, spectators or tv viewers. He then took his problem to the match referee and the final outcome was that he was quite properly penalised for the error and signing an incorrect card. This meant his half way score was was below the cut line and he ought not to have played on the weekend. He gave back the money and he goes into the records as "missed cut". I am not sure if I got the story exactly right but that is not the point. He was worried that he did something wrong that no one else had seen but he still "turned himself in"! Isn't golf a grand game! Scott McCarron used the drop rule very effectively last weekend. He was in deep rough, but got a free drop because of recent sod. Nearest relief was also deep rough, but he dropped in a spot with a slight slope that kicked his ball a few inches forward, closer to the hole. Redrop with same result. So he was able to place the ball and get a great lie. Went on to birdie the hole and win the tournament. I am confused that there was a "recent sod" in deep rough. I am also surprised that when McCarron dropped his ball within the permitted club-length of the nearest point of relief in deep rough he "got a great lie". I guess that you had to see the incident to understand the ruling! It was a great lie because after the redrop and roll closer to the hole (which was 144 yards away) he placed it onto of a clump of grass rather than in it. The way it looked, he marked the spot of closest relief with a tee, used his driver to measure and insert another tee one club length away along a line perpendicular to the target line. Then he dropped his ball very close to the second tee, and behind the line between the tees. It kicked a few inches forward of that line, so he dropped again with the same result. Then he placed the ball carefully, where it had fallen, on a clump, and played a towering fade over the trees - a shot I believe would have been impossible from the original lie. Re the sod, I'm pretty sure that's what the commentator said. Perhaps it was "trampled" by fans, but the original lie had the top of the ball well below the surface of the grass . He was way off the fairway, in an area where fans had been. If the ball was known or virtually certain to be lost in an area of casual water (water rising above the base of the shoe when standing in it) there is relief from casual water without penalty, Rule 25-1. But if the area was just soggy mud, then the ball was lost. From your new description it appears that the relief was probably permitted to take relief from a temporary immovable obstruction, not a newly sodded area.